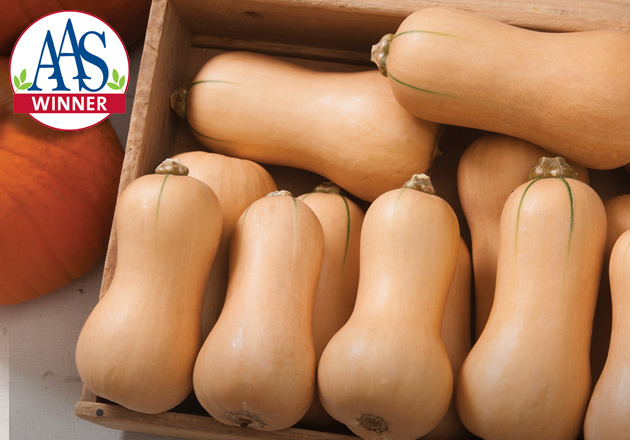 Albion, Maine: November 2014 — The All-America Selections Committee has chosen 'Butterscotch,' the newest butternut variety developed by Johnny's traditional breeding team, as a 2015 National AAS Vegetable Award Winner. When asked what makes 'Butterscotch' so special, Pete Zuck, Johnny's Product Manager for squash said, "I can tell you it has similar bloodlines to 'Metro,' though the exact parentage of this organic mini butternut is a closely held secret. "That said, 'Butterscotch' is a true stand-alone among the butternuts — it is just sweeter and better tasting than anything else we've tried." The emphasis Johnny's consistently places on flavor in selecting new varieties has stood the steadily growing company in good stead. For more than four decades Johnny's Selected Seeds breeding work has been spearheaded by the husband and wife team, Rob Johnston, Jr and Janicka Eckert. Now 'Butterscotch' is the eighth AAS Winner chosen from more than 50 new vegetable varieties introduced by the powerhouse team over the years. Johnston's lifelong contribution to the world of horticulture was underscored by his being awarded the prestigious Breeders Cup at the 2013 All-America Selection Summit. Deirdre Birbeck, Johnny's Plant Breeding Technician for winter and summer squash, shared additional observations about the Butterscotch flavor during the breeding process. "From the breeding end, I can tell you that the first cross was made in 2011, and that was grown out in 2012. We made the cross again in 2012. Just before Christmas in 2012, we tried eating it for the first time. "Something to note about Rob and me is that we have very different preferences for squash. Often times we have completely different scoring sheets, and rarely rate anything exactly the same. I was new to squash tasting then; as Rob and Janika have said, I had not yet 'developed my palate.' With 'Butterscotch,' that didn't matter. Rob and I both rated it the best tasting butternut that day (blind, with three different samples), and it was the onlybutternut that we had the same rating for. It was also the only squash that I needed more room to describe, adding that it 'gets sweeter as you chew.' "
Ms. Birbeck summed up the team's findings, "After comparing our notes that December, we knew that we had something very special. After that, we went into a pilot production for 2013 and submitted it to AAS, and the rest is history." The AAS team of judges came to a similar conclusion regarding the vegetable entry's merits. This small-fruited butternut squash has all the market and plate appeal of the vogue baby and mini vegetable category. Measuring just 6 inches in length by 3 inches in breadth, 'Butterscotch' matures approximately 10–14 days earlier than many of its larger Butternut cousins. The plants' compact vines allow gardeners of every scale to grow outstanding winter squash, whether they're a commercial producer, kitchen gardener, container gardener, rooftop gardener — or they simply want to maximize the number of plants grown in whatever space they have available. The AAS Winner also has resistance to the powdery mildew that can often plague cucurbit plants. 'Butterscotch' seed is available for immediate sale from Johnny's Selected Seeds.